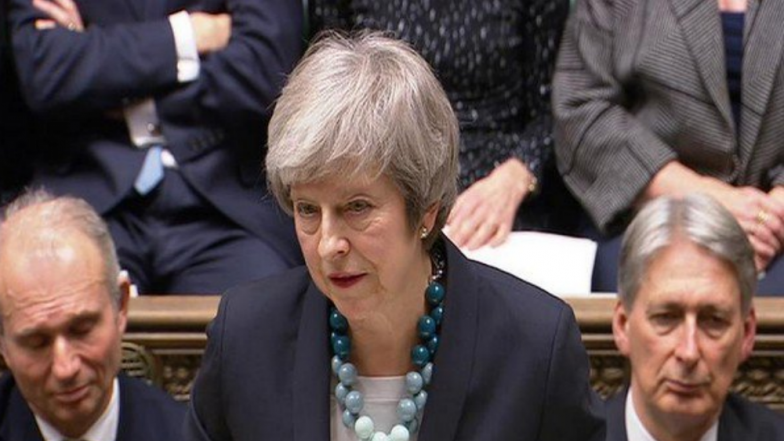 London, April 3: UK Prime Minister Theresa May has decided to seek the opposition's cooperation to end Brexit impasse in Parliament and in a letter to lawmakers on Wednesday blamed the situation on a lack of support from her own Conservative Cabinet. May, who was expected to meet opposition Labour Party's leader Jeremy Corbyn later in the day, was poised to ask the European Union for a further extension to the Brexit deadline from April 12 to no later than May 22. Corbyn said he welcomed May's "willingness to compromise to resolve the Brexit deadlock", the BBC reported. The Prime Minister's move to hold talks with the opposition angered some Brexiteers, with Wales Minister Nigel Adams resigning from his role. In his resignation letter, Adams said the government was at risk of failing to deliver "the Brexit people voted for". He became the first senior government official to step down following Tuesday's marathon Cabinet meeting, quitting as a junior minister and as an assistant Conservative whip. Theresa May to Ask EU For A Further Extension on Brexit Deadline. Adams, in his letter, accused May of "cooking up" a deal with Corbyn "who has never once in his political life put British interests first". May's decision to talk to Corbyn was a "grave error" and Britain would now "end up in a customs union" with the European Union, Adams said. The Prime Minister was also due to meet Scotland's First Minister Nicola Sturgeon and Welsh First Minister Mark Drakeford. Sturgeon called for a long extension to work out the way forward - and a public vote on any deal - and Drakeford said he wants to argue for a closer long-term economic relationship with the EU. May said her move became necessary after the Cabinet meeting broke up with no agreement on how to break the deadlock. It also came after MPs rejected her withdrawal deal a third time in Parliament, a defeat for the Prime Minister that was abetted by rebels in her own party and in the Democratic Unionist Party, her tenuous confidence and supply partners. "The question is how can we get Parliament to ratify the deal? The Government would have preferred to do so based on Conservative and DUP votes," she said in a letter. "But having tired three times it is clear that is unlikely to happen." She acknowledged that some in the Conservative Party would be uneasy about the government's decision to work with Corbyn. Her last-ditch decision to offer Corbyn a chance to get involved in hammering out a Brexit deal that would command a parliamentary majority was tentatively welcomed by EU leaders, according to Efe news. "Good that PM Theresa May is looking for cross-party compromise. Better late than never," said European Parliament's Brexit coordinator Guy Verhofstadt. She said that her withdrawal deal would form the basis of any future agreement. May said that if it fails to pass for a fourth time, the House of Commons would be given a series of votes to "determine which course to pursue". In her letter, she said that any extension period must not surpass May 22 as to ensure that the UK does not have to participate in European parliamentary elections.